BRICS states are civilized centers of the modern world, and they do not need to prove the self-evidence of their partnership. Modern BRICS has 25 formats of collaboration – meetings of leaders, ministers of foreign affairs, ministers of finance, commerce, economy, social affairs and etc. The Rossiya Segodnya International Information Agency hosted a press conference of Andrey Klimov, Deputy Chairman of Russia's Federation Council Committee on Foreign Affairs, Chairman of the Subcommittee on Interparliamentary Cooperation with BRICS States at the Federation Council Committee on Foreign Affairs. The results of the BRICS Parliamentary Forum held in Moscow earlier in June were summarized in the course of the conference. Another topic raised at the meeting was the role of parliaments of BRICS states in resolving problems of world politics and economy and in the development of the BRICS parliamentary dimension. 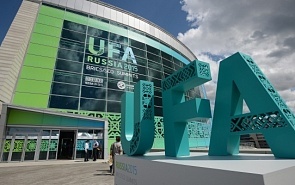 Moreover, preparations for the BRICS summit set for July 9-10 in Ufa were one of the subjects for discussions. BRICS states are civilized centers of the modern world, and they do not need to prove the self-evidence of their partnership. Modern BRICS has 25 formats of collaboration – meetings of leaders, ministers of foreign affairs, ministers of finance, commerce, economy, social affairs, national security advisors, city mayors, chambers of commerce and industry, scientists. Andrey Klimov believes that the main outcome of the forum is that it took place. Until recently, there were active rumours that some BRICS states were reluctant to back the parliamentary dimension. The rumours had certain grounds: BRICS has neither become a union nor an association. It is a group of states that has been cooperating in different formats for quite a while and that has in fact created the first serious financial institution – the BRICS Development Bank, the first session of which will kick off a day ahead of the summit. Nonetheless, BRICS, as far as its legal aspect is concerned, has not gained an official status. Klimov draw a parallel between BRICS and the World Bank, the International Monetary Fund and the European Union in the context of decision-making and manpower policy. The organizations have no younger or older brothers, no leader such as, for instance, the US in NATO. It was noted that each BRICS member state had its own political system, own political tradition, and the relations between the countries were not as perfect as one would want. For that reason, it is important that the Parliamentary Forum took place, and that its outcome is an official document, a result of an enormous number of negotiations and compromises. The joint declaration made in Moscow is a formidable basis for further developing of the BRICS parliamentary dimension. Russia, in particular, formed a committee for cooperation with BRICS states at the Federation Council to provide organizational assistance to all necessary parliamentary elements of the format. Brazilian colleagues have created a commission that envelops both houses of their parliament. Speaking about the common context of interstate relations, Andrey Klimov noted that BRICS was not aimed against anyone. Its goal is to protect national interests. Besides, BRICS is building up new platforms that are independent from governments, for instance, the BRICS Youth Summit, which will be held in Kazan, as well as the Civil BRICS Forum. Every year, activities within the framework of BRICS are getting more and more diverse and extensive. In conclusion, the expert emphasized that the parliamentary dimension of BRICS will create new opportunities for a fair dialogue and will help give an adequate response to modern challenges. BRICS lawmakers advocate intensification of existing cooperation mechanisms. Unlike our opponents, they remember lessons of history.